This year I’ll be cozied up at home with the family on New Year’s Eve, but I wanted to take a moment to reminisce about one of the best New Year’s I have ever spent at The Point Resort in the Adirondacks. Stretching out over the serene Saranac Lake, this resort has all of the classic winter getaway charm, updated with beautiful cozy cabins to match the breathtaking views. 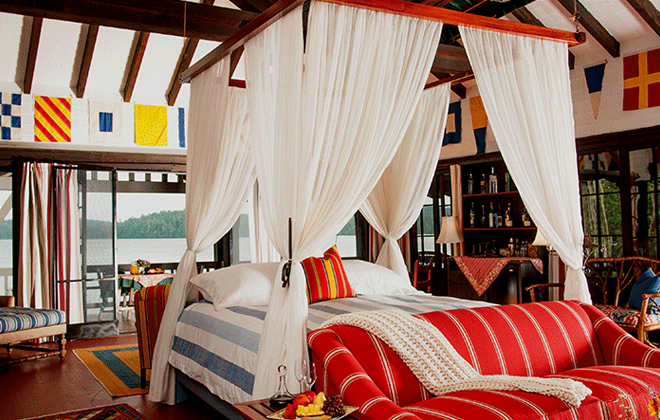 It is as if you were living in Ralph Lauren’s dream boathouse. Only it is so much better. Originally built in the 1930s, the camp served as a private woodsy retreat for the Rockefeller family. Hidden within acres of forest, the lake front property truly is the most wonderful, quiet mountain retreat. When the retreat did change hands into a resort, the owners we sure to maintain all of the rustic elegance and log cabin luxury from the Rockefeller days. Staying here is like going back in time to an era of cocktail hours and dinner attire – a good old fashioned getaway. It’s so far off the beaten track, that guests don’t find out the exact address until their booking is complete! This just adds to the feeling of really getting off the grid, and immersing yourself in the cozy but luxurious resort milieu. When we arrived, I cried with joy at how amazing it was. I know that sounds a bot over-the-top, but it’s true. I really cried tears of joy! How wonderful is this view in the Boat House? 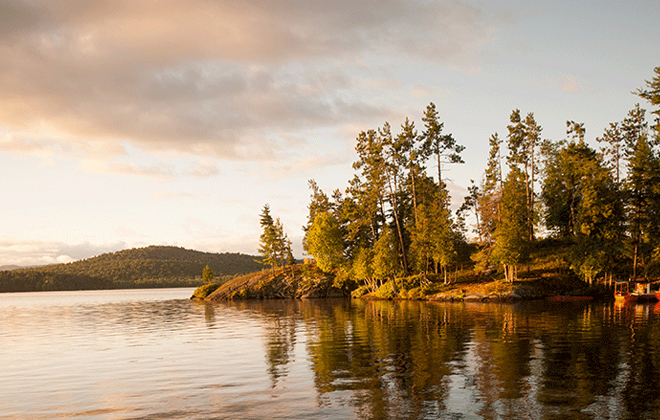 Can you imagine waking up to a sprawling lakefront in the morning? Early this year I was both shocked and really saddened to hear that the Point risked foreclosure after years of battles over loans and mortgages taken out by the previous owners during the height of the financial crisis. But a couple who has been long-time guests for the past 24 years decided to step in and buy the property along with all of the furnishings and equipment up for auction, just in order to keep running the place as is. Which is so wonderful to hear, as it means that The Point will continue to run with top notch service and fabulously restored and updated rooms. It is so magical of a place you really wouldn’t want anything to change here. And after the year we have all had with too much loss all around, I can’t bear the idea of losing another beloved person or place! 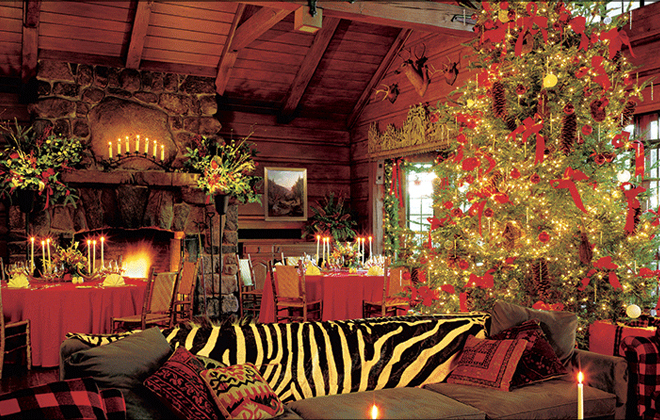 The Point lodge all dressed up for the holidays! It looks exactly like this picture. No photoshop magic here. There really isn’t anything like being in the mountain air, cozying up to a winter fire, and having the beautiful lake view out every window. It was also so lovely to ring in the New Year in such a beautiful place, with such elegant style. Call me old fashioned, but it’s nice to have a reason to get dressed up for dinner, I just love seeing all the men in their black tie, and the women all dazzling – it’s all quite Gatsby in the best of ways! We rang in the new year with an elaborate dinner served fireside, then we all changed out of our finery into clothing suitable for tobogganing onto the frozen lake while fireworks went off overheard. Not to mention the fireside drinks that we all had served to us as we sat in — wait for it — adirondack chairs wrapped in sheepskin throws. Even though this year I’ll be doing something quite different this year, it’s still nice to remember those wonderful moments life gives us. This year has had many ups and downs for us all, but as we near the close, I’d like to focus on all of the love, support, and positive energy that I find all around. So wherever you will find yourself this year, I hope we can all bring a lotta light, love, and a few fireworks with us into 2017. Wishing everyone a happy, healthy, sparkling and safe New Year!